[Frances Anne Spencer-Churchill, Duchess of Marlborough, grandmother of Winston Churchill.] 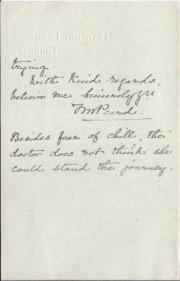 Autograph Letter in the third person to 'Mr. Adam', regarding the Duke's attendance at a parliamentary 'Committee on the Vane Estate Bill'. On embossed letterhead of Blenheim Palace, Oxon. 26 July 1861. 4pp, 12mo. Bifolium. In good condition, lightly aged. She asks Adams to inform her 'what day has been fixed for the Committee in the Vane Estate Bill' (in which she clearly has a family interest), continuing: 'When the Duke of Marlborough saw Mr Adam with Lord Redesdale last night he understood that Tuesday next was the day on which he was to be present in order to give his consent to the Bill; he has since heard from Mr. Wagstaff to say that Friday or the following Monday will be the earliest day on which the Bill can be committed. [ Frances Parkinson Keyes, bestselling American novelist. ] Three Typed Letters Signed to collector Eileen M. Cond, discussing her whereabouts and other matter. 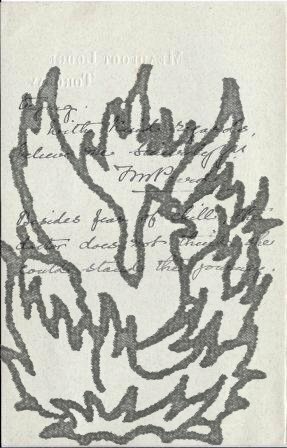 All three on her letterhead, from Beauregard House, New Orleans. 1952, 1961 and 1962. Each of the three items is 1p., 4to. All three are signed 'Frances Parkinson Keyes'. The three in fair condition, lightly aged and creased. ONE: 19 March 1952. She was in Europe when Cond wrote her note, 'so it had to undergo several forwardings; and since my return to the United States, I have been struggling to mreet the deadline of my new novel, so my correspondence is in arrears'. She is enclosing 'some of the autograph slips which are made especially for me to paste in your copies of JOY STREET and DINNER AT ST ANTOINES'. TWO: 15 February 1961. [ Blanche Atkinson; Ruskin; RSPB ] Leaflet entitled "A Woman's Question", about the "slaughter of birds for ornament"
Two pages, 8vo, fold marks, some wear on a fold mark, grubby, bottom edge chipped, all text legible. Bottom of verso, copies obtainable from the author of from "The Hon. Sec. of the Society for the Protection of Birds, Mrs. F.E. Lemon [...]" No copy on COPAC etc. [ Jane Wardle, psychologist. ] Three Autograph Letters Signed (all 'Jane') to her father the painter Peter Wardle, together with a small collection of childhood writings and drawings. Two of the letters from 48 Abingdon Road, Oxford, and one on letterhead of the Department of Experimental Psychology, University of Oxford. One of the childhood items from Lidstone, Enstone, Oxfordshire. All items undated (adult letters pre-1991). Wardle's achievements as a leading behavioural scientist in the field of cancer prevention are described in her obituary in the Guardian, 24 November 2015. The three adult letters addressed to 'Daddy'. One four-page letter on yellow paper with loss from damp damage, the other items in fair condition, with light signs of age. One of the other two letters also of four pages, and the last of one page. The letters are intimate and positive, filled with loving encouragement and advice and giving family news. [ London linen trade in early-Victorian period. ] Autograph Letter in the third person from 'Miss A Dealtry' to Messrs Wilson of New Bond Street, linen drapers, placing an order and including a swatch of fabric. Bedford Square [ London ]. 29 November [ 1838 ]. 2pp., 12mo. Bifolium, addressed, with postmarks, on reverse of second leaf, to 'Messrs. Wilson | Linen Drapers | New Bond Street', and also docketed '1838 | Dealtry Miss A'. In frail condition, with the two leaves separated and closed tears and wear. Sewn with white thread onto the second leaf of the letter is a swatch of cloth - dark blue with white and red stripes - in a loop of circa 20 x 1.5 cm. The text reads: 'Miss A Dealtry wishes Mr.
41 Manchester Street, Manchester Square [London]. 6 August 1866. 3pp., 12mo. Bifolium. In good condition, lightly aged. She thanks her for the care she took of her pocket handkerchief, and for the 'truly friendly note which gave great pleasure'. She is glad she was pleased with her book 'The Lives of the Seven Bishops Committed to the Tower in 1688', and hope she will accept a copy, 'as a trifling remembrance of me and our occasional pleasant chats together, in the lovely gardens at Fulham Palace'. She offers her remembrances to 'the Bishop of London Mrs.
London: Published by His Majesty's Stationery Office. 1923. 28 +  pp., 8vo. Stapled. In fair condition, aged and worn. With stamp, shelfmark and label of the Board of Education Research Library. Eight copies on COPAC, but uncommon nevertheless. Hendon. 29 January [no year]. 3pp., 12mo. Bifolium. Good, on lightly-aged paper, with short closed tear at head of second leaf. She begins: 'I was so disturbed and disappointed when I came in on Tuesday to find I had missed you. And I believe you had been kind enough to call when we ought to be, and almost invariably are in - after 4. Autograph Letter Signed, in the third person, from 'Mrs Harford', guest of Mrs Martin of Camden, Chiselhurst, asking 'Mr Wilson' to procure her a ticket 'to see the preparations in the Abbey' [for the coronation of Queen Victoria?]. 2pp., 12mo. Good, on lightly-aged paper. Considering the fact that Mrs Harford states that she is staying at the home of Mrs Martin, and that Mr Martin died in 1832, it seems probable that the letter refers to the preparations for the coronation of Queen Victoria, which occurred on 28 June 1838. The letter reads: 'Mrs Harford understanding that people are admitted to see the Preparations in the Abbey & thinking it probable that Mr Gillen may have been employed in the decoration, will be very much obliged to Mr Wilson if he could procure her a Ticket to see them. Seven Autograph Letters (five signed) from Mary Frances Stevens of Albany, New York: five to her mother and two to her father, including a description of a party at her home for her husband's friend Daniel Webster followed by a political meeting. All seven letters from Albany, New York; those to her mother dated 27 August 1842, 2, 19 and 24 September 1844 and 24 September 1848; those to her father dated 24 January 1846 and 22 October 1848. Mary Frances Stevens was the daughter of Silas O. Smith of Rochester, and the mother of the novelist Augusta de Grasse Stevens (1852-1894) and of Marie de Grasse, Lady Evans (d.1920), wife of the English Liberal politician Sir Francis Henry Evans (1840-1907). After her husband's death in 1854 she married John Fowler Butterworth. The seven letters in this collection are closely and neatly written; those to her father in brown ink and those to her mother in blue. All seven in good condition, on lightly-aged paper. Autograph Letter Signed ('Samuel Stevens') from the barrister and Whig politician Hon. Samuel Stevens of Albany, New York, to his future father-in-law Silas O. Smith of Rochester, asking for permission to court Mary Frances Smith. Albany [New York]. 21 January 1841. 1p., 4to. Bifolium. In good condition, on lightly-aged paper. Addressed on reverse of second leaf to 'Mr Silas O Smith | Rochester'. 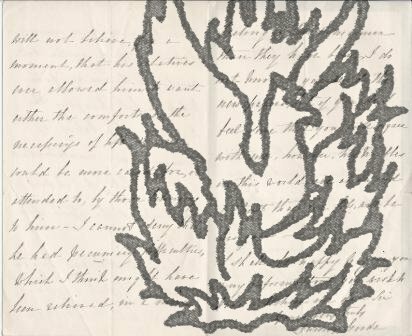 The letter begins: 'Dear Sir | During my short sojourn at your city last October, I had the pleasure of making the acquaintance of your daughter. Since my return a correspondence has taken place between us in which she has given me permission to visit her & to entertain the hope that she may be persuaded to exchange the protection of the best of Parents for that of a husband. On one side of a piece of wove paper, 15.5 x 9.5 cm. In fair condition, on aged paper, with one creased corner and a small nick at the head. The drop-head title is in capitals, with the second line having only the opening quotation marks (before the initial word 'BEWARE'). The poem is 29 lines long, with three seven-line stanzas followed by an eight-line one. At the foot of the poem: 'Albury. Mary Frances Tupper.' The first stanza reads 'The stamp of Rome is on their heart, | Take care! take care! | They play the Jesuits' crafty part, | Beware! beware! Eight Autograph Diaries of Frances Barbara Airey ['Fanny Airey'], daughter of Sir George Airey and his wife Catherine, daughter of Lord Talbot de Malahide, written in Paris, 1850-1866, with references to political events and expatriate high society. The eight volumes written in Paris, and dating from 1850, 1851, 1852, 1853, 1854, 1856, 1857, 1866. Eight tall and thin 8vo diaries of unusual shape: the first six 34.5 x 13.5 cm, the last two slightly smaller. The first diary has 120pp., the others of similar length. With between two and four daily entries to a page, depending on the volume. The diaries are elegantly printed by a number of different Paris publishers (Dechamp; Pirmet; 'E. J. '; 'M. et H.'; 'F. G.'; 'B. L.'). Five are bound in light-brown cloth, with coloured paper labels stamped in gilt; the other three have printed paper boards. Two Autograph Letters Signed (both 'F M Peard') from the Victorian author Frances Mary Peard to the wife of the London solicitor Robert Cole, FSA, regarding the physical condition and situation of 'the Signora', 'Mme Sineo [Sineo-Benaducci?]'. 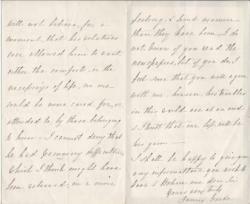 Letter One: 7 June [1880s? ]; Sparnon, on deleted letterhead of Meadfoot Lodge, Torquay. Letter Two: without date or place. Both items in good condition on aged paper. A dramatic, almost novelistic correspondence, regarding 'the Signora' (named in the second letter as 'Mme Sineo', who is staying at her house in Torquay and is apparently too frail to return to her London house. Letter One: Docketed 'No 1'. 12mo, 4 pp. Peard states that she has not 'written of late about the Signora. She has got fairly well again, but she does not seem to us fit to return to London, & I hear that her doctor does not think she ever will be fit.